Am I mad? I'm looking at origin and contemplating handing EA $80 Australian dollars. For a game I know uses an online server, which I really dislike the idea of. I've been watching GameplayJenny and really liking the look of the game. Has the problems with servers been solved? Anyone else from Australia bought it? No. And I'm not going to buy it either. To be honest, EA has in the past handled their server issues badly, and I'm not convinced that they've changed their M.O. on that. 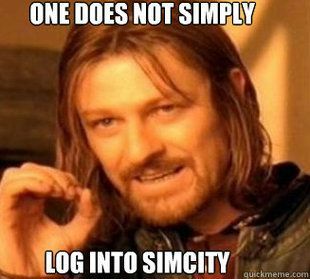 Quote: Important Note on "SimCity"
Some customers may experience delays when connecting to SimCity servers. EA is actively working to resolve these issues. Please visit https://help.ea.com/en/simcity/simcity for more information. For your trouble, every SimCity player who has logged in and activated their game will receive a free PC download game from the EA portfolio, provided by EA. This offer extends to all digital download and physical disc SimCity customers. On March 18, SimCity players who have activated their game will receive an email from EA telling them how to redeem their free game. So in short - huge disaster! I'm personally not interested in the game, but if I were, I'd at least wait until these issues are resolved. I bought the game, however not had a chance to play it or Sims 3 University. So I cannot say the server issue has affected me. But for those who played it the minute it arrived, there was huge disruptions. I still have tons of accounts paperwork to do and can't play right now. But will most likely wait until the issues are resolved before I make any attempt to. Well I'm a nut case anyways... so I bought it. Took ages to download and update then a couple of goes to get origin to respond, but I get the non responsive thing happening any time I play sims 3 so I expected that. Then my internet decided to go on the fritz for awhile. Hasn't done that for a few days so I guess it was time for it to stomp around about and have a tantrum. Finally, later this afternoon the net came back, Origin worked and a server was available so I played for ages off and on until my city was full. I think a slower growing city would be the way to go next time. joandsarah;18765 Wrote: Then my internet decided to go on the fritz for awhile. Hasn't done that for a few days so I guess it was time for it to stomp around about and have a tantrum. Finally, later this afternoon the net came back, Origin worked and a server was available so I played for ages off and on until my city was full. Yeah see, this is the thing. When my internet is out is exactly when I'd want to play a game. It's ridiculous that they force you to be connected to the internet just to run it. Glad you like the game itself though. It is ridiculous; ridiculous and annoying. I don't want to multiplay with other people, unless that was an arranged set up thing say with online friends for one particular night; that could be fun. But other people just showing up and building next to me, no way, I turned that off right away. I also don't like this cloud storage idea so like Sims 3 I will play this with a throw away attitude. I've uninstalled Sims 3 a few times and never bothered to make a back up. Sims 2 now i back up constantly with a full one every few months to an external hard drive and I have sims extracted and stats written down, etc, etc. Everyone says online is how Sim 4 will go, which is stupid as most gammers I know like solitary play doing things their own way; they don't want the possibilities of shared play or 'gammer 1b5' coming along and altering their set up. I can’t imagine storing anything important in a cloud set up either. I want to be able to store it on my own hard drive. If I lose it well at least then I only have myself to blaim. Sharing is great when people feel like sharing, I love lets plays and online live simming-when someone else is doing it. If I had to broadcast my own old croaky voice I'd probably never go online again. Well, it is of course to prevent piracy; they say it is to help us all have an online experience of awesome, but it is to stop illegal downloads. Also, I don't trust EA to keep that server up, and they are obviously not very good at server management. If there was an option to run it on a local network I might be tempted. I've heard rumours they (modders) might be able to make a mod to allow single sandbox play to be off line. I'd be all over that if they do. I think you would still load up online but then after that be able to disconnect. That might also just be pie in the sky.